I'd love to talk more about BlogHer, but it'll have to wait (although you can see a few of my photos on Flickr). Tomorrow morning I'm taking my blogging self to Los Angeles on a trip sponsored by Ford, to go behind the scenes of the TV show On the Lot. The whole group of bloggers, which includes Liz of Everyday Goddess and Megan of Divine Reality and A Girl Must Shop, will get to hang out on set, drive around L.A. in Ford Escapes, and be treated to lots of California-style entertainment. I'm particularly looking forward to the road rally. I've been both driver and navigator in rallies before and they're always a lot of fun. I'm very interested in getting to be a part of a blogger relations program of this magnitude. I'm curious as to what Ford hopes to accomplish by exposing bloggers to their product in this way and I'll be quizzing their PR people about it from the moment my plane lands. Since this is more of an "official blogger" event for me than BlogHer, I will be bringing a laptop and blogging throughout. Unless I can find the cable for my camera, I might not be able to include pictures until I get home, though. It sounds like a blast and I'm really looking forward to meeting the other bloggers. If you're an "On the Lot" fan and there's something you'd like me to try to find out, let me know! My brain is so full from the past few days that I don't know what it'll take to dislodge a memory or two to chronicle the event. I had a great time, particularly meeting so many of the bloggers I read and also ones I've met at previous years' conferences. I went to some great sessions and really enjoyed both the planned activities and the ones I sought out on my own. I haven't had time to go through all of the business cards and swag I collected, nor have I dumped my photos to my computer yet. I'll try to put together a more comprehensive post soon, but it may have to wait until the weekend because I'm leaving for Los Angeles tomorrow morning and I won't be back until Thursday. That doesn't even count all of the other lovely people I met and dined with, but that comprehensive list of links will have to wait until I've tackled the 100+ business cards I collected. I was disappointed that I never ran into Yvonne from Lip-Sticking, even though I know she was there. That can happen when you put almost 800 people in a convention center, I guess. Okay, it's time I made myself semi-presentable for work. More later, I promise. I ended up cancelling my evening plans yesterday due to sheer exhaustion. Instead, I took a short nap, made myself some business cards, and took another stab at the mounds of laundry. Now I just need to finish packing, shower, buy some more Airborne at the drug store in case my suspicion that I'm fighting off a cold is actually true, and head to my credit union for some traveling money. Oh, and I'm going into work this morning for a few hours. I don't know what drove me to that genius decision, but at least I'll be a bit closer to the airport there than I would have been at home. If you're headed to BlogHer yourself, have a good trip and I'll see you this afternoon or evening. I didn't get home from band practice until after 10:30 last night, so I've been frantically doing loads of laundry ever since. Frankly, I'd have benefited more from extra sleep instead, but I can't seem to get more than about six or seven hours a night. I may very well end up checking into the hotel tomorrow and taking a nap for a couple of hours! It doesn't really matter what I take to wear, so I'm not worried too much about that. My husband is getting my camera a new Flash card (I'll have to ask him to buy batteries, too) and I'm going to skip trying to print quickie business cards for myself in favor of letting Wendy Kline make me some when I get there. I was hoping to have two of my band's songs on CD (or iPod) to bring with me. I'll have to see if the guys made any progress last night on the guitar sound. I wanted to re-do my vocals on the second one, but I don't think I'll have time. This morning I need to go by my credit union, deposit a check and get money for the hotel and miscellaneous meals. I found a dollar in the dryer, so I'm already ahead. That just leaves packing, which I'll probably start tonight and finish in the morning. My main imperative is to take my expensive lip glosses out of my purse and put them into my suitcase so the TSA doesn't take them away. Beyond that, I'm just going to pick out my favorite t-shirts and coordinating Converse and throw them into my duffel bag. The real kicker is that I'll be back in town exactly one day before I leave again. Next week I'm going to L.A. on a sponsored blogger-relations trip. I'll tell you more about that later. 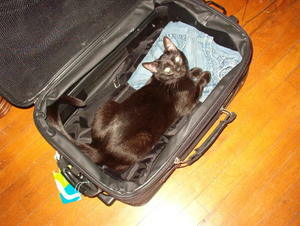 Like last year, I've decided not to bring my laptop with me to BlogHer. I know! It sounds crazy not to directly blog a blogging conference. However, for me it's more about meeting people and learning things. I can always make notes and blog when I get home - and I will. Thus, this is probably my last post of the week. I'll start my BlogHer recap on Sunday evening. Until then...enjoy your week! It's a little scary that I'm leaving town the day after tomorrow considering that I have 200 pounds of dirty laundry piled in my basement and have given no thought to what I'm going to pack. All is not lost, though - I've started delegating. My husband has generously offered to make a pilgrimage to Micro Center (such a sacrifice for him to make a trip to his favorite store!) and get me a bigger Flash card for my camera. I am determined to take a reasonable number of photos at BlogHer this year, for once. Before I go, I need to do something about the blue streaks in my hair. The blue is fading quickly, even though it's only been a little over a week. I have purchased two different semi-permanent blue dyes with which I hope to keep nursing the color along until my next hair appointment. I wouldn't mind the fading so much except that light blue looks an awful lot like grey, and I don't want to run around with white or grey streaks in my dark hair. That would tend to reverse the kind of impression I was trying to make. Tonight I have a practice with the cover band for which I auditioned last week. Apparently they liked me. The good news is that we're practicing in someone else's studio instead of the tiny, ring-y basement room where we got together last time. I'm still bringing ear plugs, though. I won't be taking the Jeep with me to practice this time. Last Thursday's gig pretty much finished the poor thing off until it can have some serious repairs done. By the time my husband managed to limp it home, the engine was knocking so loud I could hear it a couple of blocks away. Even before that, the steering rack (or maybe the tie rods) were protesting even the gentlest turn, and of course, the air conditioner isn't working. We're going to drop it off with our favorite slow mechanic with the idea that by the time we: a) have the money to pay for repairs and, b) need it for winter driving conditions, it'll be ready. The timer for the banana bread just went off, so I'll wrap this up. Enjoy your Tuesday and if you're going to BlogHer and haven't yet commented, say something! If you don't read She Doesn't Get It, you should. Two sisters take turns answering the same questions submitted by readers, and their answers are always fascinating. Last week I asked them, "How much of your life do you try to plan versus just riding things out and seeing what happens?" You can see Blondie's answer here and Dorothy's answer here. It's no secret that I stay very, very busy. I consider an empty calendar space to be a sign that I need to find something interesting to do that day, pronto! Some days, I end up with so many activities that I have to print out my calendar to make sure I don't forget something. Even so, I occasionally get so busy and sidetracked that I simply fail to show up for something. It makes me feel like a horrible flaker, but it's almost unavoidable under the circumstances. You'd think with a framework like that, I'd be equally regimented about what I expect to happen when I arrive at each activity. In reality, that's where all planning goes out the window. For example, I'm leaving for BlogHer on Thursday. My flight gets in around 2 p.m. and I'm leaving around 4:30 p.m. on Sunday. In between those times, I have absolutely no idea what's going to happen. Of course there's the conference on Friday and Saturday. I'll attend both days and maybe I'll even decide in advance which sessions I'm going to attend. I don't know exactly when I'll track down my roommate, SueBob, after I get into town, nor do I have any idea where or with whom I'll be having dinner on Thursday. At some point, I'm planning on meeting up with Bruno for coffee - maybe Sunday morning, but we haven't set a time. That's how I always travel and I love it that way. Detailed itineraries are just not for me. Sure, I have a couple of ideas about other things I might like to do while I'm in Chicago, but it won't be the end of the world if I can't work them in. I feel the same way about life planning. I've never been the sort of person to try to plan my life as a whole. Even growing up I didn't have anything set in my mind about whether or not I'd get married (I did), have children (I didn't), or work in a particular industry or job. When I was a kid and one of our cats had kittens, my mom would always tell us, "Don't pick up the kittens, just put them on the floor and watch what they do." I've managed to apply that advice to my entire life: I don't try to force the action, I just sit back and watch what happens. I actively pursue the things I really want to do and then let the pieces fall into place from there. It may not be the most efficient way to make things happen, but it certainly keeps the stress down. So what's YOUR planning style? I've been blogging since 2004. I've attended every BlogHer conference so far. I've been married for almost 13 years and we have three cats. My real job is as an interactive copywriter at an advertising agency. On the side, I am the lyricist and vocalist for an original metal band, as well as the vocalist for a classic rock cover band. You should be able to recognize me this year by the blue streaks in my hair. I'm really looking forward to this year's conference. Leave a comment if you're going! Don’t call me a brine shrimp. Sprung to life from just a little pouch. Because I just can’t get enough of you. Until I die within one to two years. If you forget to feed me. I am not a brine shrimp. Do brine shrimp live in rocket ship homes? Can brine shrimp perform tricks? Do brine shrimp bring laughter to children the world over? Have brine shrimp known love? So don’t call me a brine shrimp. If my love for this poem makes no sense to you, read my Sea-Monkey Diaries. On Monday afternoon, I went to my hair stylist and had blue highlights added to my hair. The blue covers a lot of the dark brown, too, so the effect right now is mostly black hair with blue highlights - kind of like Superman's hair in the old comic books. Reaction has ranged from bewilderment (my dad and step-mother) to enthusiastic approval (my husband and the band for which I auditioned yesterday). I'm sure there are people questioning my sanity behind my back, but I've already been through all of the realistic hair colors, so now it's time I got creative. Because I work in the creative department of an ad agency, there's nothing in my life that precludes me from running around with blue hair. I waited until my Soroptimist Club presidency was over, just for propriety's sake, and now I figure I'm free to look any way I want. The audition went well last night, incidentally. I think the band has the raw materials to get four or more sets learned and ready to play out in a couple of months. Unfortunately, their practice room is tiny and my ears are still ringing this morning. That setup is going to have to change - particularly since my not-25-year-old ears don't bounce back as well as they used to anymore. So that's my news for now. Today's the day the conference kicks into high gear, with classes spread out over several buildings. It's going to be a long, tiring day. Wish me luck! My husband has a Jeep Grand Cherokee that we mainly keep around for when it snows. It also comes in handy when we have to haul music gear, but that doesn't happen very often. A month or so ago, our guitarist was over and we decided to take the Jeep to dinner because our other cars had too much music gear in them. As soon as we opened the Jeep door, a wave of unspeakable stench leaped out at us. It's difficult to describe the odor, but it definitely involved the rotting of something formerly alive. I would have guessed that someone went fishing and left their catch in the back seat all through the spring. However, we don't fish. We rolled down all the windows, but it didn't really help. When we got back home, I searched carefully under the seats and sprayed every available fabric-covered surface with Febreze and then left the windows down for a couple of days. The smell remained. We kept speculating about what the smell could be. Did an animal somehow get in and die? Did we run over some roadkill that just lingered because we so seldom drove the vehicle? There was no telling. Yesterday I needed to haul a small PA system, so my husband readied the hot, stinky Jeep. (Did I mention that the air conditioning doesn't work? That makes the experience extra special, let me tell you.) There was a bunch of random music gear in the back, so he started pulling out cymbals, cables, etc. to clear a spot for the speaker. When I got home to switch cars, my husband had some news: he'd found the source of the smell. Back in March, my husband's sister came into town with her son and husband. We'd all gone out to dinner and ordered way too much food. It turns out one of the take-home containers of food never made it out of the Jeep. One of our guests had tucked it behind the back seat and it had vanished into the sea of music gear. Thus did a styrofoam clamshell of barbecued beef ribs decay in our hot Jeep for FOUR MONTHS. When I heard the story, I said, "How bad was it?" "I didn't open it!" he said. What I meant was, how bad was the smell in the Jeep? It turns out that it's much better than the last time I experienced it. Still, there's a lingering funk that I think will take a good deal more Febreze and fresh air to dissipate. I can stand it (really, the heat's worse than the smell), but I wouldn't offer anyone a ride right now. I'll be driving the Jeep again tomorrow to my vocal lesson and on to my audition with the classic rock band. I'm hoping that a good shot of air freshener in the morning will clear out the last of the smell, but I'm not counting on it. The whole experience makes me want to clean out all of our cars so that no food item could ever again slide out of sight. I'll probably just settle for paying more attention when we get home from dinner from now on.